Kelly is our office manager. 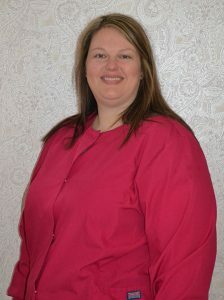 She has been exposed to all aspects of dentistry including assisting, radiology and managing the front desk. She is always making sure that our patients are accommodated and pleased with their experience. Her expertise is in scheduling, verifying insurance, pre-authorizing treatment plans and patient communication. Outside the office, she spends her time with her husband and 2 children. She enjoys playing volleyball, softball and going to the movies.